Considered to be one of the most beautiful atolls in Polynesia Tikehau is a graceful oval crown of small islets, with an interior lagoon 16 miles across and a pass for small boats through the coral reef. Located on a secluded pink sandy beach fringed with coconut palms the Tikehau Pearl Beach Resort is a pearl to discover in the Tuamotu Islands. 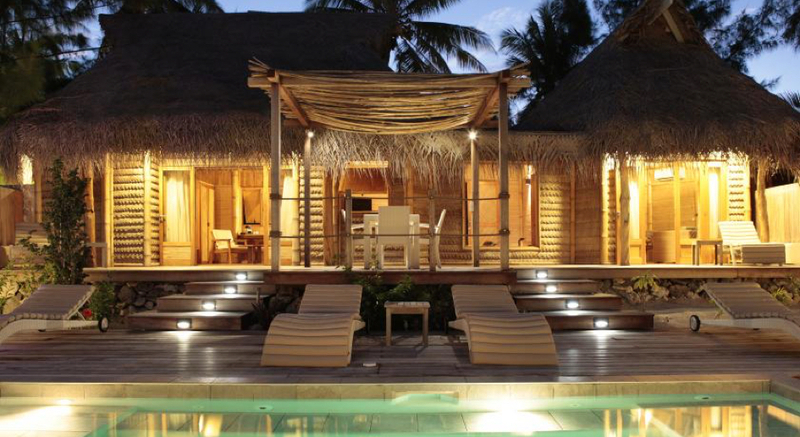 The Tikehau Pearl Beach Resort offers Beach Bungalows with air conditioning and Overwater Bungalows and suites. The beach bungalows are located on the beach facing the blue pristine lagoon. Their outdoor bathrooms are their charm. The overwater bungalows and premium overwater bungalows located at the beginning of the first pontoon. They feature a glass bottom table to enjoy the spectacular underwater life of the lagoon. Located at the end of the first pontoon, the premium overwater bungalows feature a glass bottom table and also offer a direct access to the translucent lagoon. The overwater suites overhang the calm sandy lagoon on the second pontoon. In addition to their spacious size, they feature a number of facilities which will make your stay most enjoyable. All bungalows, designed in true Polynesian style, are very spacious (55m²) and are equipped with a fan, mini bar, coffee / tea making facilities, direct dial phone, safe, television and private verandah. Many excursions and activities are available to enhance this heavenly location; snorkeling, canoes, kayaks, sunset cruises, picnics, bicycling and scuba diving to name a few. The bar and restaurant located poolside provide an idyllic setting to observe the shimmering stars in the night sky. The Manea Spa specializes in massages and treatments using traditional Polynesian methods and 100% natural products from the island’s flowers and plants, including the famous Monoi Oils from the coconut palm. A Remarkable Honeymoons Package will include a fresh flower lei greeting, round trip resort transfers, your choice of accommodations and a farewell shell lei. Additional inclusions, meal and beverage packages may be available for your dates of travel. As our valued clients, you will receive a fresh flower lei greeting upon arrival and airport assistance. Upon your departure you will receive a farewell greeting and a Tahitian shell lei – when you book your flights and accommodations with us.